Barnes & Noble said Nook sales dropped 34% in its fiscal fourth quarter. Barnes & Noble is starting to have second thoughts about the Nook. After sales of the e-reader and tablet line fell 34% in the company's fiscal fourth quarter, which ended in April, Barnes & Noble (BKS) executives said Tuesday that it's time for a change in strategy. The bookseller will stay the course on its e-reader business, but Barnes & Noble plans to pursue a partnership to help it make Nook HD tablets. The company will continue to sell Nook tablets in stores, but future devices might be co-branded with the new manufacturer's name as well as the Barnes & Noble logo. "We are 100% not exiting the device business," insisted William Lynch, CEO of Barnes & Noble, on a conference call Tuesday. Lynch did not name the company that Barnes & Noble will partner with, but he said that more information on device strategy would be released in coming months. The news comes on the heels of an industry rumor that Microsoft (MSFT) is considering the purchase of the Nook brand. 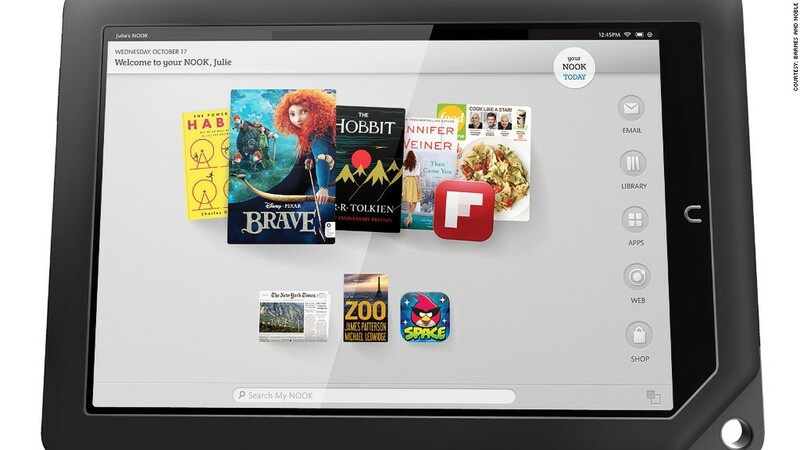 The software giant already invested in the Nook business, taking a 17.6% stake in April 2012. Microsoft declined to comment about its future plans for the Nook. The bookseller's stock fell by about 18% after the earnings report was released Tuesday morning. Barnes & Noble said the Nook HD has simply become too costly to produce, despite the fact that its has successfully reduced overhead costs in recent months. The company spent $26 million less on the Nook when compared to the previous fourth quarter. The bookseller said it will continue to build its digital catalog and add thousands of e-books every week. Its digital sales decreased by almost 9% for the fourth quarter, but Barnes & Noble noted that the decline is party due to drop in device sales and also because popular novels, such as The Hunger Games and Fifty Shades of Grey trilogies, were best-sellers a year ago. Overall, Barnes & Noble reported a fourth quarter net loss of $118.6 million, nearly double its loss from a year ago. Revenue fell by 7.4% to $1.3 billion. Consistent with prior years, Lynch expects the company to open five new stores in the coming year while closing between 15 and 20 stores.